One of the most common questions I hear in my networking groups is related to which of the social media scheduling apps for direct sales and home party plan reps is the best. In this post I am going to be comparing several different social media scheduling and management apps: CinchShare, Post My Party, Post Planner, Vizzlie, Post Cron, TinyTorch, Synduit, Hootsuite, Buffer & Sendible. I will be breaking down the costs, features, benefits, ease of use and an overall impression of how well I feel the app/program works for direct sellers, network marketers or party plan reps in marketing their business. These are not listed in any particular order. A few links are affiliate/partner links for sites that I personally use(d). Being an affiliate for any of these sites has in no way influenced my opinions or the content of this post. Everything is 100% my own opinion based on personal use. UPDATE: As of 4/18/18 – Facebook no longer allows 3rd party apps to schedule posts to EVENTS. I have been using Post Planner for several years now. It offers a lot of features that other social media scheduling apps do not offer. A lot of the top online marketers and social media experts recommending Post Planner and I can understand why. Price: Starts at $3 a month for small plan up to 2 accounts, then $9 a month for the Love plan which allows up to 5 social accounts, (this is not 5 sites, each page, group, profile counts as a separate account) and 50 posts per day with 500 planned posts. $15+ up for Guru accounts with more accounts and features (up to 12 accounts, 120 posts per day, unlimited planned posts). There are higher up plans you can request for more details on. Pros: What makes Post Planner so unique is their viral content finder. You can search for content to share from quotes, images, questions, articles and more related to your niche, based on keywords, hashtags and more. You can even set it up where Post Planner suggests related content. This is great for increasing engagement on your Facebook pages especially. Post Planner is the only scheduler I have found or used so far that offers a Repeat Forever option on posts. This means if you have evergreen content or do daily or weekly theme posts you need to post every week or month, you can schedule it ONCE and select for it to repeat FOREVER. I love this feature because I manage 3 Facebook Groups where we do a daily theme/topic each day. Guru accounts and higher have some additional features to help with growing your social media presence even more. You can also design and add directly from Canva to Post Planner. Cons: Cannot schedule to Facebook Events. Only works with Facebook and Twitter. Limited # of pages, profiles & groups you can schedule to in the lower price plan. Ease of Use / User-Friendliness: 9 out of 10 stars here. The interface is visually appealing and very easy to set up, figure out how to use and get your content scheduled out. Mobile App: Not available yet, but the site is mobile friendly & easy to use/view in a mobile browser. Overall opinion: The viral content finder in Post Planner is just plain amazing to me. The option to have repeating posts is worth the $7 a month for the time it saves me each month. It is great for managing your Groups for your team, customers and Facebook pages, but again if you do FB parties you will still have to use another program for that so it might not be the best overall option for a direct seller. Free-Trial: There is a free version that allows you access to just 2 accounts/services with limited functionality. Post Planner has a 100% satisfaction guarantee if you join at one of the paid accounts and cancel within your first 30 days you can ask for a pro-rated refund for any time left. CinchShare was made specifically for direct sellers so it offers many options to help you with managing your pages, groups and yes finally, Facebook Events for your parties! The team behind CinchShare is continually working to improve and add more features to their program. Price: $10 a month or $8.84 monthly if you choose the annual option. Social Media Network Scheduling Supported: Facebook , Twitter & Instagram. You can pin your scheduled and past posts directly from CinchShare to Pinterest, but not actually schedule them in advance. Pros: CinchShare is really set up for the direct seller and home party plan consultant in mind. All the features, benefits and options are geared towards how direct sellers are (or should be) marketing their business on social media. The options to post to Facebook Events – including events set up on personal profiles, pages and groups is the key feature that I love as a direct seller. Being able to see your scheduled posts per event, group or page and the timeline, create categories and text clips, view your history and reschedule content makes it a great app for direct sellers hosting online parties. Cons: No automatic repeat option for posts, a small learning curve to figure out some of the advanced features but they do have a lot of video tutorials and training available. Ease of Use / User-Friendliness: 8 out of 10 stars. CinchShare is fairly easy to set up and figure out. There are a lot of good tutorials and a FB support group for users plus they offer training webinars each week to explain and show how to use the system. 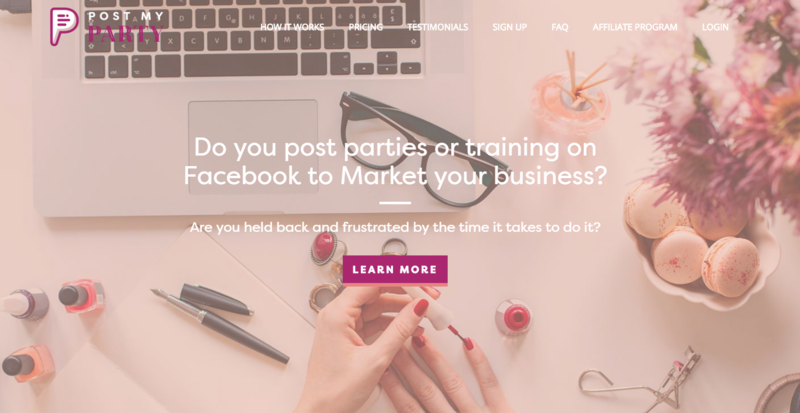 Overall opinion: I use CinchShare for all my FB Parties and Events- even my monthly online training and networking events for CEO of Me and have been very happy with it. I like that it was created for direct sellers and the focus is on continuing to make it a great tool for direct sellers. It is still missing a few features that I need so it is not an all around solution for me personally. You may still need/want to use one of the other programs too if you are needing to schedule to other networks or have repeating posts but for online parties and Facebook pages and groups it’s a solid option for direct sellers. Free-Trial: Yes, use my code CEOCinchFree for a free 30 day trial through my partner link. PostCron is a pretty robust social media scheduling app. They offer a lot of options and features in their free plan and even more features for a very reasonable price especially compared to a lot of the other apps. Price: There is a free plan with limited features and options. Paid plans start at $9.99 a month and if you pay annually you can save 15% annually, making it $99.99 a year. Pros: Works with several networks and all Facebook options from pages to profiles, groups and events. You can also add team members to your account which is great if you have co-hosts for events or a virtual assistant who helps you schedule. Being able to schedule to Twitter and Pinterest Boards is another key feature. There is also a feature to get content recommendations for Twitter and a content gallery for additional content ideas (not anywhere as robust or custom as Post Planner’s though). I also like the watermark option for adding an automatic custom watermark to your photos, ability to bulk upload & add team members – those are all pro features only though. PostCron also has a Chrome extension to help make it even easier to schedule and add content to your que. Cons: I really could not find many cons for PostCron in the time I have been testing it out, the user interface could use a little improvement and there is no option to schedule repeating posts which is a bummer for me, but might not be an issue for someone who doesn’t need that feature. They also do not offer the option to design and add from Canva like some of the other programs. Ease of Use / User-Friendliness: 8 out of 10 stars. Postcron recently did a major upgrade to their user interface that makes it look and work much better! They also have some new tutorials to learn the system and great new features. Mobile App: Android & iOS. Overall opinion: I have been really impressed by PostCron. You can do a LOT in the free version that you would be paying $10+ a month in most of the other apps. Their first level paid version offers a lot more than some of the other programs for a lower price. I think it’s a great option for direct sellers to use for their social media and FB parties, although there doesn’t appear to be a way to reschedule content, create categories or text clips like you can in CinchShare for your FB parties, so keep that in mind but I think it’s a solid option for direct sellers to check out especially since they have the Instagram scheduling now too. Free-Trial: There is a free version you can use that includes most of the features and a limited # of accounts. Use my referral link to get 10% off your plan if you decide to sign up for the Pro version. TinyTorch has some pretty unique features and was also created with direct sellers and small business owners in mind. It started out as a free program but due to a lot of issues with FB’s API/Spam filters, they have had to change their set up and limit the # of posts for the free plan. It is still worth taking a look at and might be a great option for a new consultant who does not have the budget for a paid plan. Price: There is a free plan with limited features and options. Paid plans are $10 a month or $100 a year. Both plans have limited posting and content abilities. Social Media Network Scheduling Supported: Facebook: Fan page, Profile, Event, and Groups and Twitter. Pros: TinyTorch offers some really neat features and options like being able to set up “collections” of posts that you can easily reschedule later on. This is great for your FB parties or resharing posts on a regular basis. You can also set up Templates to use for your FB Parties and events now. It is also very easy to figure out and use. The creators are very involved and interactive with their users. The Pro version allows you to upload multiple images to a schedule post which is great for Facebook parties. Cons: In recent months, TinyTorch has had a lot of issues with Facebook and being blocked for spam, not just a few posts but the entire app and all users and scheduled content blocked for hours and even days. This led TinyTorch to have to set limits to have many posts can be scheduled per user, per account, per day. There is no automatic repeat feature. Ease of Use / User-Friendliness: 10 out of 10 stars. TinyTorch is very simple and easy to set up, use and work with. You should be able to get everything set up and running in it with very little to no frustration. Mobile App: No, but compatible with most browsers and the site is mobile friendly. Overall opinion: Before all the FB spam/blocked issues & them limiting the options in the free version, I highly recommended TinyTorch. After all those issues, I stopped using it. Things seems to be working fine now with their new limits though and the creators are really nice guys who truly care about their users and creating a great experience for them. I think the free version is good for someone who only does a few parties a month and does not need all the extra bells & whistles or does not have the budget to pay for one of the other platforms. The paid version, since it is the same price as some of the others but has a lot less options, I’m not sure I would recommend it over CinchShare or PostCron. Free-Trial: There is a free version you can use that includes most of the features and a limited # of accounts. Post My Party was also created for direct sellers who host virtual Facebook parties or training events online. Their focus is on making party posting easier. Social Media Network Scheduling Supported: Facebook Groups & Events only. Pros: Created to use for your online Facebook parties with really easy to use options and features to make your Facebook parties an easier, less frustrating process. Great tutorial videos, support access and an online support group too. The shining star of Post my Party is the Party Templates option, this truly makes creating your party templates and rescheduling them for all your parties a breeze. You can also share your templates with other users which is another awesome feature especially for recruiters to be able to share with their teams and new recruits. I also like that you can schedule comments on posts too which is very helpful if you are wanting to include additional info or doing multiple parties at the same time. They also offer scheduling to FB Pages and Page events now. Cons: While you can schedule posts to groups, you cannot schedule a party template for a hostess to groups. This limit is understandable due to FB’s recommendation that parties be held in an event, not a group. However, I know many DS reps like to do parties in their VIP groups each month. Ease of Use / User-Friendliness: 8 out of 10 stars. There is a bit of a learning curve to setting everything up but the tutorial videos are really easy to follow. Once you have it all set up, it is very easy to work with on future parties and events. Mobile App: No, but the site is fairly easy to use on mobile browsers. Overall opinion: I think Post My Party is a great option for your online Facebook parties. I love the template options and being able to share those with other users & your team. If you are needing more robust scheduling and options for your FB Pages, groups and other social media networks you may want to look at a different option or using Post my Party along with another program. Free-Trial: You can try Post my Party for free for 14 days, then it’s $9.95 a month. Be sure to cancel before the 14 days is up if you decide not to continue to use it. Vizzlie is a new platform also made specifically for direct sellers who host virtual Facebook parties. Price: Free, limited use option and then $10 a month or $100 a year. Pros: Vizzlie is very basic and easy to set up and use so if you do not have a lot of technical skills and only need the basics for your FB parties it might be a great options for you. It was created specifically for FB Parties for direct sellers so most of the features focus around that. The free plan allows you to manage limited pages and events so if you only do a couple parties a month and are looking to save $ it might be perfect for you. I also like that they have an email campaign option with the paid service, that feature is unique to Vizzlie compared to the other direct sales focused social media scheduling tools. They also have an option for creating templates and saving images and videos in a gallery as well as sharing your templates with other users / team members. Cons: It only works with Facebook and does not have as many bells and whistles as other similar programs but if you don’t need the extras it might not be an issue. Ease of Use / User-Friendliness: 9 out of 10 stars. It’s pretty straight forward and easy to use and get going scheduling with it. Overall opinion: I think Vizzlie is a great option for those who really only want and need the basic features for scheduling for their parties and FB pages and groups and/or those who maybe are a bit tech challenges. It’s also a great option for those who only do a couple parties a month or maybe use something else for their page scheduling that has more options/capabilities. I do think the user interface is a bit clunky and outdated looking, but it does what it needs to do. Free-Trial: There is a free limited plan for Vizzlie you can use as long as you like and/or upgrade for more features and options at only $10 a month or $100 a year. Synduit is more than just a social media scheduler. They provide customized content depending your niche and some even for specific direct sales/network marketing companies. They also provide email marketing and contact management and you can add on text messaging to your plan as well. Price: Packages begin at $19 annually and depending your # of contacts and whether you add more than 1 industry, whether you add text messaging it could go up to $100 a month. Social Media Network Scheduling Supported: Facebook & Twitter only. Pros: Synduit provides a nice all in one system for content, social media, email marketing, text messaging, contact and list management, event invitations, lead pages, tracking and more. They also offer custom content suggestions based on your industry / niche and even specialized content for several direct sales/network marketing companies. Your subscription also includes access to a stock image site. Synduit offers a lot of easy, drag and drop, customization for your social media images, presentations, powerpoints, printed fliers and much more. The platform is very user friendly and easy to understand and set up everything you are working on in your business. They also offer a lot of extra resources, tools and coaching for their users. Ease of Use / User-Friendliness: 7 out of 10 stars. I give this rating because there is a lot more offered in this platform and more to learn how to utilize and set up but it doesn’t require you to be tech savvy in order to use it. Mobile App: Yes, but I feel it is easier to use the platform on desktop. Hootsuite has been around for several years now and is very popular with online marketers and bloggers due to it’s management and monitoring features. It offers a lot of options and tools. Price: Free with 3 social accounts, (this is not 3 sites, each page, group, profile counts as a separate account) $9.99+ up for pro accounts with more accounts and features (up to 50 accounts – so you could handle multiple groups and pages with the pro account). Cons: Cannot schedule to Facebook Events. The multiple options and set up is little overwhelming to someone who is not very techy. Ease of Use / User-Friendliness: 5 out of 10 stars here. The interface is not visually appealing and there’s a pretty big learning curve to getting it all set up how you want it. Overall opinion: The monitoring features to see all your social media accounts in one place to easily reply, connect, share is nice instead of having to login to multiple sites and apps. Since you cannot schedule to Facebook Events, this won’t work for doing FB Parties though unless you are doing them in groups which is not recommend. Being able to schedule to Instagram is a nice feature though you still have to go in and manually click for it to post. This could work as a great tool for managing your social media, scheduling to several sites and FB groups and pages, but you will need to use something else for FB events. 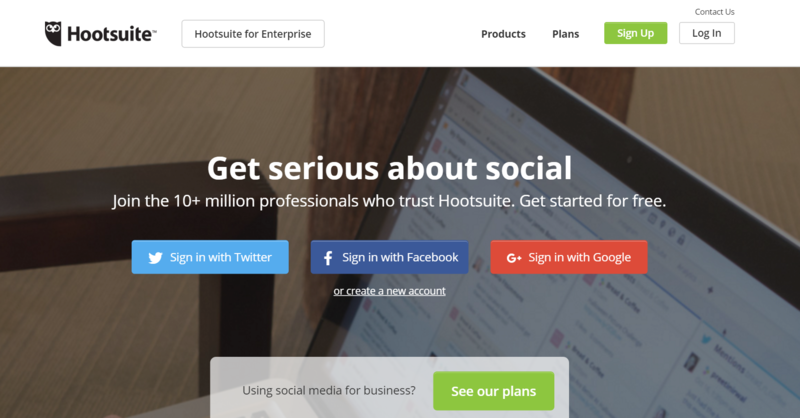 Free-Trial: Yes, free 30 day trial of the Pro Version of Hootsuite. Buffer is another social media scheduling app that offers a lot of good options. They also have a free version with limited posting capabilities that might be worth checking out or using in conjunction with one of the other services. Price: Free version with limited options, paid versions start at $10 a month. Cons: No ability to schedule or post to Facebook events. With the free version you can only have 1 profile, page or group per social media account set up. Ease of Use / User-Friendliness: 10 out of 10 stars. This is probably my most favorite thing about Buffer, that it is so simple, sleek and easy to schedule and track in. Overall opinion: I have always liked Buffer and it’s ease of use and the Chrome extension. I also liked that you can schedule to Pinterest with the paid version. However after testing out PostCron for this review and seeing that they offer both of those options and more in their free version, I would now recommend PostCron over Buffer. You cannot post to Facebook events so it’s not going to help with scheduling FB parties either. I think Buffer is going to be better for a blogger or online marketer. Free-Trial: There is a free version you can try out with limited features. A few of the upgraded features offer a free 7 day trial. Sendible is a similar to Hootsuite where it focuses on monitoring, tracking and scheduling your social media. There are a lot of extra features with Sendible. It is geared more towards social media managers and larger businesses but they do have individual plans and a lot of options that fit what direct sellers need. Price: Tester Plan starts at $9 a month for up to 5 accounts (each page, group, profile counts as a separate account), the next level is $39 a month. Cons: The price for the 2nd pro level at $39 a month is pretty steep compared to other services that offer similar features and options for 1/3 or less that monthly price. Sendible also while it does have many features and options, can be overwhelming for those who are not as skilled with technology. Ease of Use / User-Friendliness: 6 out of 10 stars. Once you get everything set up and figured out, it is easier to use, but there is a definite learning curve and frustration while trying to get it set up and figure out their system. Free-Trial: Yes, a free 30 day trial available. Visit Sendible’s pricing page and click on the SEE ALL PLANS underneath the higher price plans. This will show you the plans that start at $9 a month. I wish I could say there was 1 clear winner and 1 app I could 100% recommend that offered all the features I want and need. Unfortunately that is just not the case for me. What I can share and recommend is that right now I am using CinchShare for my Facebook Parties & Training Events in my Groups and have been very happy with their service. I am using Post Planner for the repeat/recurring posts in my groups, FB page and for their viral content feature. (It’s worth the $9 a month just for the repeat post feature for the hours of time it saves me each month.) I was also very impressed with the recent updates to Post my Party and PostCron. I would suggest to try a few of these out and see which ones you like, work best for you & offer what you need. I hope this review post has been helpful! I would love to see your thoughts in the comments below and for you to share this post on social media with your friends and team members! Which social media scheduling apps are you using & what do you love about them? Are there any others I should add to this post? Great info. I have been looking into one that you did not check out. MarGo. Thanks Marianne! I have looked at MarGo before but it doesn’t appear to be an actual social media scheduling app. From what I understand it is mainly for sending invites and follow up for online and home parties? Perhaps their site just doesn’t have a very good sales/info page. I’ll definitely add it to my list to look at further. Great insight for us – thanks so much! I have more to add to my task list now. Hi Noel! Thanks for commenting. I reviewed Post My Party in the article, it’s in the 2nd half. I think it works great for online parties but was disappointed they don’t allow scheduling to pages which means you’ll still need to use another app for other social media scheduling. If you do a lot of parties each week it might be worth it for you but I’d definitely check out some of the others too. I know it’s frustrating, hopefully Post my Party is open again for groups at least soon! I am looking for the ability to post multiple pictures on one post to mainly a Facebook group. Have you run across anything able to do that? All I have seen is a single picture per post or a slideshow. Post cron told me they had it in the works but no date or other info. Hi Jamie! My understanding is that is a Facebook API limitation, so it’s just not something that FB allows to be done through any of the schedulers right now. So until FB has it set up to allow it or someone creates a workaround, the best options are to either do a collage photo or to create an album of pictures on your public FB page or in the group – then to schedule a post with the link to that album in the post so it shows /links to the whole album. Hopefully someone will have multiple image scheduling available soon or FB will open it up for all. Do any of these post discreetly? Meaning that when they post it doesn’t say where it was posted from? Scheduling is necessary but I feel like it takes something away from your post when it’s obviously scheduled. I am pretty sure Post Planner only shows as posted by Post Planner to the user for scheduled posts, so someone else wouldn’t see that. I am not sure about the other services. I think most people understand now that posts are scheduled and why we need to do that as business owners. If you are being authentic in your posts, giving great value and being interactive on your page, group or online party, I don’t think anyone will feel like you are being spammy or that you don’t care. Being able to schedule content actually allows me to have more time to respond to comments and questions and have time to post organic posts each day too. I’m currently using Cinchshare for direct sales Facebook events and was interested in Post My Party because of the template feature. Has PMP had any more trouble recently with Facebook blocking that other schedulers? Hi Lyndia! I have not personally heard anything about them having any issues with being blocked. I know that all the apps were having issues with pictures not showing the text but that was a FB API issue and not the scheduling apps fault. Hi Misty! You mentioned that PostMyParty group posting was limited. In what way? Hi Michelle, yes it only allows you to schedule/post to FB Events mostly, you can post to groups but it’s limited. They do not offer or allow scheduling or posting to FB Pages or any other social media networks. I did email their support to ask about this and was told they did not plan to add those scheduling abilities, they wanted to keep it for parties primarily. Thanks for this comparison, I’m new to the world if direct selling, and working on streamlining things! Do any of these platforms allow users to auto-post to their Facebook groups? I’m not an admin of these groups, and I hear that Facebook’s new API only allow admins to auto-post to groups. Hi Ryan, it’s my understanding that FB only allows admins of groups the ability to schedule posts / auto post to reduce spamming. I am not aware of any apps that allow members to schedule to groups because of FB’s rules. I’d love to know your thoughts comparing just the party template feature of tiny torch and post my party. Hi Stacy I have not used Tiny Torch since they added the party template so I cannot provide a comparison on that feature right now. I’ll try to take a look soon and update my post though. Thanks for the questions! Thank you!!! This was very informative! I like the template aspect of Post My Party in that if your outline has specific names and links, you can change them once and it changes throughout the event. Cinchshare, although you can “batch” post, if the host’s name and link is in the post, there is no quick way to modify it throughout. Are you aware of any other third-party posting companies that have the template like PMP but that you can utilize in groups? I didn’t see any in your explanation, but I may have missed it. I’d love to hear your thoughts on a new site I’ve been working on – Soapbox Events. It’s a little different in that it does not rely on Facebook, but it has a lot of the post scheduling and templating features you mention in your analysis above. Thanks! Great comparison. Very useful and I love that you compared them on all the same points. I’m looking for a company that can do all of the automated posting, planning and party posts but also as a manager of emails lists with auto responders and landing page with funnels. Is there a company that can do this.I have multiple DS bussinesses with cystomees that buy from more than one. I also have multiple pgs and social media accts. Help point me in the right direction please if you can! Hi Jana, I do not know of 1 program that will do all of that for direct sales businesses. There are some email programs like Mailerlite (my referral link is https://beaceoofme.com/mailerlite ) that can handle the multiple email lists, landing pages and funnels but it doesn’t have a social media scheduler so you would still need to use another program for that. I don’t know of any programs that combine email automation with social media scheduling too that would work for DS bizes, anything that offered that would be something that would require you to have your own website and ecommerce platform. A 2017 update for this post would be great. I know that PostCron has an app now and I wonder what else has changed on these platforms in the past year! Thanks for the overview! Hi Morgan, I do update this post about every 5-6 months and updated it last in February 2017 including the updates to Post my Party, Cinchshare & adding Vizzlie. It looks like PostCron added the mobile app 2nd half of Feb so that’s why it wasn’t reflected in the last update. I will update that part now. Thanks for the head’s up! I will check again around June/July and update any others. Thank you so much for sharing all this wonderful information! I just recently joined the forces of direct sales and have been trying to figure out which social media sharing application would be the best fit for my business. You have showed me multiple great options to choose from. Wish me luck! Happy selling!!! Hi Scott, thanks for your comment. I did look at Multibrain a couple months ago but it appeared to be more focused for local marketing and most of my community is not focused on local marketing. Also the power boosting option really concerned me as I do not recommend boosting posts, I recommend using the Ads Manager & Power Editor for better targeted marketing. I’m intrigued you now offer branded editions for those companies though so I will reconsider adding it to the post in a future update though. I typically revise and add new to this post every few months. Feel free to email me at misty@beaceofome.com if you would like to discuss the new features more. Thanks! Hi Misty! Great article. I am wondering if you have heard of, or have any input on, the scheduler called Publer? Hi Danica, I have not heard of it but just pulled up their website and they look fairly new. I will add it to my list for future review updates though! Thanks! Hello Danica and Misty. Just ran across your comments. I’m one of the guys behind Publer’s and I can help you with any questions you may have. Misty, we just launched an ambassador / affiliate program (with some very high commissions) in case you’re interested in doing a review of what we’ve built. GREAT info!!! Would you happen to have the comparison in a side by side spreadsheet format?? Just curious. Thank you!!! Thank you Jennifer! I don’t have a side by side comparison at this time but will add it to my list for an idea for a future update as I do update this post every couple months. Thanks! Hi Michelle, I’m not aware of any ways to do that right now unless you can do it through some of the apps that do allow Instagram scheduling like maybe Hootesuite or Later, but I imagine the person would have to have a business Instagram account and be able to add you as an authorized team member. I know there are social media managers who schedule IG posts for others BUT the posts still show as that person and they have to authorized to post. However, you could send the images and texts to the hosts and have them post them for you that might be an option. Thank you so much for sharing your insights! I love the article. Is there an app that can post to Messenger? I would like something that would post invitations or thank you notes to guests. Hey Karen, sorry I just now saw this. You can use ManyChat which is a FB messenger chat bot program to schedule Messages, set up different lists and do broadcasts to FB Messenger. People will need to subscribe just like an email service in order to receive the messages but it’s pretty simple to set up and use. If Facebook is not allowing 3rd party apps to assist in posting for events what is everyone using? Ex I scheduled 2 parties exact same time was hoping to preschedule the posts so I could interact on each .. hoping you have a suggestion thanks! Hi Mallory, most people have switched to doing their parties in FB Groups instead of events. Some people are setting up a new group for each party then closing it. Some are using their VIP group and doing multi host parties one day each week. Some are setting up a separate FB group only for their parties. Hope that helps! Is there one of the above apps that will allow you to have multiple different parties scheduled. We have a Facebook party and a crock party would like to have both set up and handy for all who want to schedule parties. Would prefer to do as events so that each one expires after the party dates. Hi Theresa! I would recommend Cinchshare or Post my Party for that. Unfortunately, Facebook took away the ability for ANY third party apps to schedule posts to Events earlier this year so none of them schedule to events due to FB no longer allowing it. You’ll have to do the event in a Group or on a Page. Hootsuite is super popular for a reason – because it’s great – but I’ve tried Post Planner and it’s quite nice as well, and it’s a few dollars cheaper per month. I’d suggest trying both and seeing which one you like best. Thank you for your wonderful breakdown of all these programs. I was wondering if you found any social media scheduling apps that allow you to upload and schedule RAW Video? I am trying to see if I can find an all-in-one scheduler instead of having to use a scheduling program AND Vimeo/YouTube. Hi Lora, You can schedule a video direct to FB via FB’s built in scheduler. I am not sure if any of these schedulers have the ability to schedule a video direct or not I haven’t personally tried as I have found it best to upload direct to Facebook for any videos I want posted there. Misty…I can always count on “coming home to CEOOFME” to get back on track!!! You just have that magic touch that others say the same thing, but your language just “clicks that light bulb” and makes it work. This information will help me with my 2019 Planning and Goal Setting, as this is the year I have decided to do more online with my business. THANK YOU for sharing from your heart. Great information! Very helpful for someone looking to simplify social media posting and more. The pricing is also no longer based on an email list size! Hi Halli, thanks for letting me know. I do update this post usually once every 6 months, the last update was in November so I’ll be sure to update the info on Synduit soon.